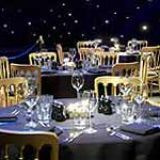 The Voodoo Rooms is a multi purpose venue where you can enjoy a meal, drinks, live music or one of the regular events. 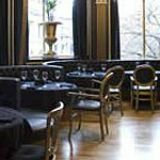 The food menu offers a variety of dishes made with fresh, Scottish produce and the bar is stocked with a wide choice of drinks but specialises in rums, tequillas and cocktails. The Voodoo Rooms specialises in cocktails, rums and tequilas. The bar is always free entry but individual events in The Ballroom and Speakeasy may be ticketed - prices vary. Over 18s only. No stag and hen parties. What did you think of The Voodoo Rooms? Great vibe, great people, great food. This is a favourite of ours, the food is excellent, as are the cocktails. Even just hanging out in the bar is a great way to spend an evening with friends, the music is eclectic and varied so are the people for the most part too! The ballroom is something to behold as well! This has to be the best looking venue in Edinburgh, and there is no shortage in this town! One of Edinburgh’s premier after dark hangouts. The Voodoo Rooms is tucked away on the far side of St Andrews Square. With a luminous red glow emitting from its upper floor, this cocktail bar is begging to be found. 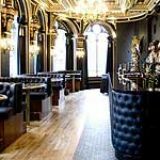 On entering the building you may be forgiven for thinking that not too much has changed since it used to be Cafe Royal, however, you only have to get half way up the flight of stairs to discover there is an intimate music room on the right hand side and a small bar for company. 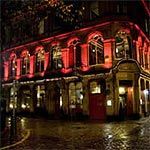 The flight of stairs is where the similarity between the Voodoo Rooms and its predecessor stops, no longer is there a traditional pub awaiting you, but a real luxurious place for everyone, from students to even the most snobby cocktail connoisseur. On entering the main bar area you almost feel like you are thrown into the set of Bugsy Malone. Classy over head lighting and comfy leather booth seats make this a place that’s somewhere to sit down, relax and spend time enjoying a nice classic cocktail or for the more daring, a well made original cocktail prepared on the reccomendation of the talented bar staff. This place has an unbelieveable array of cocktails. And if spend enough time here, you will see a great variety of them mixed, shaken and stirred by the skilled staff. Rasberry Mojitos are particularly good, put together with a great degree of skill and passion, it blends the refreshing taste of rasberry, mint and Cuba’s finest rum to create a sweeter version of the classic concoction. If rum is not your drink of choice, do not worry, the list of drinks is endless. Hidden away in two separate rooms are live music stages. Alot of the acts that go on are laid back acoustic acts and jazz musicians, which really suits this venue down to the ground. The venue also showcases a lot of soul, funk, deep house and hip hop. Brand New Heavies, King Britt, Guru are the sort of names that grace the Voodoo stage. 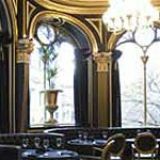 Even if cocktails are not your thing, The Voodoo Rooms is well worth checking out just for the amazing ingredients and original decor.